2019: Gifts for any Celebration! It is a new year and Birthdays, Anniversaries, and Holiday Celebrations are headed your way! Every year Kids for Kids helps our supporters give the best gifts to celebrate their special occasions – gifts that create a lasting impact. Over Christmas many of you so wonderfully donated a goat to a child in Darfur on behalf of a loved one! In return, Kids for Kids sent you a Gift Certificate in commemoration. 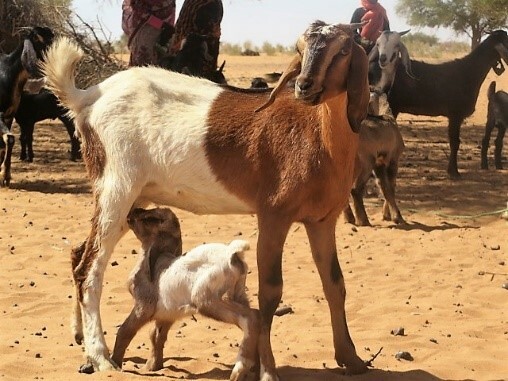 The goat you donated will help a family in Darfur, giving the children milk to drink and their mother a way to earn an income. Can you imagine a gift more special than this? All year round we can make you special personalised Gift Certificates to celebrate the milestone events in the lives of your friends and family members. Maybe your Mum is turning 70 this year? Donate some goats in her name, helping malnourished children in Darfur! Looking for the perfect Easter Gift? Why Chickens of course! Is your best friend about to have a new baby? Donate mosquito nets and blankets to keep all the children in Darfur warm and safe at night! Maybe your son is turning Five Years Old this year ? Why not make a donation of £50 in his name – enough to purchase uniforms and shoes for five children in Darfur?! If you donate a Handpump for clean water, a Kindergarten, or a whole village we can even name these after the gift’s recipient, creating a lasting memorial. No one is too young to learn the value of helping others. No one is too young to make a real difference. An example of a Gift Certificate! Give a Goat Now to transform children’s health and empower women in a region that is in desperate need of help. Goat’s milk is precious – it is full of protein, minerals and vitamins that mothers cannot afford to give their children in any other way. Children make great shepherds in Darfur and love their goats. Let’s see if we can make their dreams come true this year!